The Devotion to the Miraculous Infant Jesus of Prague began and spread from central Europe throughout the world. While few has been said about Christ's infancy, through His words; visionaries and saint, we have learned much about the importance of the 'state of infancy' and the child-like qualities that one needs to adopt in order to enter into God's kingdom. The very qualities of child-like simplicity, trust, humility and dependency that characterize children need be contemplated, accepted and eventually adopted in our own lives as we live and struggle in a world of challenges and contradictions. 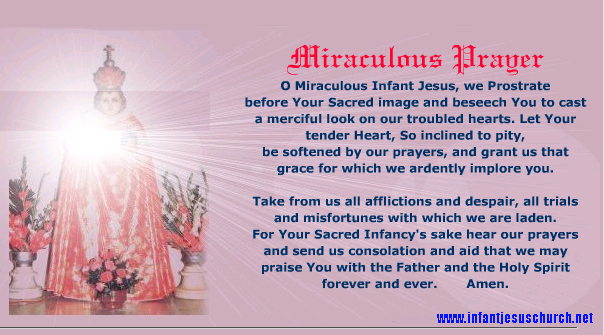 The Miraculous Infant Jesus will be presented in this website with prayers, novenas and videos from the church so that all may find fulfillment in their own personal and private devotion. Enjoy! I am beg you my father, pl help me, pl solve all my husband debts, how long we have to pay interest. my father i am fully believed you, you can help me. My husband last her father and sister now you are my father, pl solve all his problem. I am your daughter, please reduce my weight and give wealth and health. pl give directions and knowledge to my big son. Today my son examination, pl give directions to write and give full memory power. My both children, grandmother and fully family give good health and wealth. Dear infant jesus heal my daughter Miriam from two black spots on her face. PLS PRAY THAT MY HOME LOAN IS SANCTIONED SOON.THANKYOU.LOVE U JESUS. I'm jeevan 32 years old ,Im looking for a partner for a while,Infant jesus kindly bless me with Anila in my life. I'M vivekanand.M i need a new job as of now i lost my present job.god i am just look for you great miraculous. i know god nothing is impossible for you lod. have mercy on me and my family. Please pray for my brother Bernard David who is appearing for an important entrance exam today.Please pray that he gets selected.